Obama’s National Security Policy Looks Like Bush’s Third Term. Thank Goodness. Exactly right. I fear that Obama is busily making a mess of the economy — or rather, more of a mess. But on national security, it becomes clearer every day that despite Obama’s persistent sniping at his predecessor, we’ve essentially re-elected George Bush, and I for one am grateful. 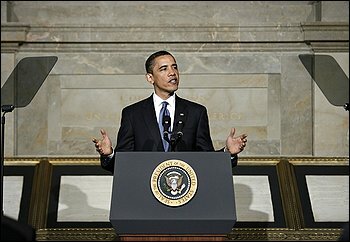 After starting by retaining Bush’s Secretary of Defense, Obama has begun a surge in Afghanistan, adopted Bush’s timetable for withdrawal from Iraq, authorized repeated Predator drone strikes on al Qaeda targets in Pakistan, affirmed the use of military commissions, and yesterday acknowledged that some terrorists will have to be held indefinitely even though it will not be possible to prosecute them successfully. Obama’s fellow Democrats are helping to save him from his ill-advised promise to close Guantanamo within a year — the Senate vote eliminating funding for the closure was 90-6. On the torture issue, Obama is trying to reclaim the moral high ground for America, and as long as he continues aggressively prosecuting the war, I largely wish him well. It will give him a means of staking out a genuine policy difference, it may gain us some goodwill abroad, and if a time comes when we once again have a Khalid Sheikh Mohammad in custody smirking that “soon you will know” about imminent terror attacks, I strongly suspect that somebody will find a technique and a justification for doing what needs to be done. Of course he quickly slipped back into campaign mode and blamed every problem on the Bush Administration. But that will get old quickly, even among his supporters. Meanwhile, look to his deeds, not just his words. This entry was posted in Uncategorized and tagged Bush's Third Term, Guantanamo, Islamic Fascism, Krauthammer, KSM, Obama, Torture by Kirk Petersen. Bookmark the permalink.